The Kulturforum is a unique complex of museums, concert halls and libraries, based at the south-eastern end of the Tiergarten. Every year, some of the most outstanding European art museums, as well as the famous concert hall of the Berlin Philharmonic Orchestra, attract millions of visitors who are interested in culture and music. The Kulturforum, based in the former West Berlin, has been growing since 1956, as a counterpoint to the Museumsinsel in the former East Berlin. Here visitors can admire some of the best examples of modern architecture in the capital. Adm. charge; free Thu eve. Enjoy a break around the quiet back of the Nationalgalerie. 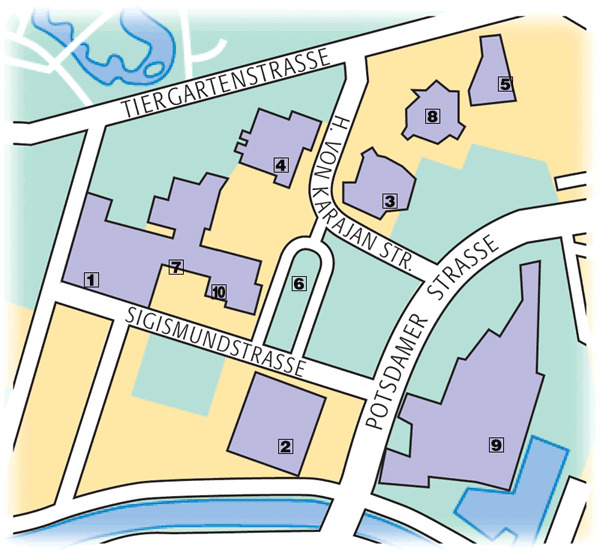 A day ticket (€8) gives admission to all museums. Berlin’s largest art museum boasts some of the finest masterpieces of European art. They are displayed in the modern Neubau, built in 1998 by the architects Heinz Hilmer and Christoph Sattler. The superb collection includes paintings by Holbein, Dürer, Gossaert, Bosch, Brueghel the Elder, Vermeer, Titian, Caravaggio, Rubens, Rembrandt and many others. Based in a building by Mies van der Rohe, the gallery exhibits mainly 20th-century art, with an emphasis on German Expressionism, such as Karl Schmitt-Rottluff’s Farm in Daugart (1910) . 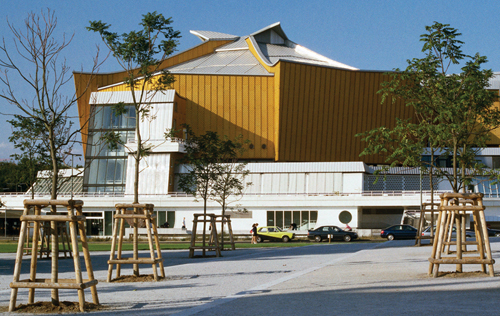 This tent-like building, designed by Hans Scharoun in 1960–3, was the first new structure in the Kulturforum. Considered one of the best concert halls in the world, it is the seat of the Berlin Philharmonic Orchestra. It is also known, jokingly, as “Circus Karajani”, after Herbert von Karajan (1908–89) who conducted the Philharmonic Orchestra for many years. Sir Simon Rattle has been the conductor since 2002. Craft objects from the Middle Ages to the present day and from around Europe are on show here, including valuable items like this Baroque clock and the Guelphs’ treasure . Concealed behind the Philharmonie is this fascinating little museum of musical instruments. More than 750 exhibits, particularly of early instruments such as harpsichords, are on show , as well as a 1929 Wurlitzer. The smaller relative of the larger Philharmonie, this concert hall is one of Germany’s most highly regarded venues for chamber music. It was built in 1984–8, to a design by Hans Scharoun, carried through by his pupil Edgar Wisniewski. The Gallery of Prints and Drawings holds more than 520,000 prints and 110,000 drawings from all periods and countries, including a portrait of Dürer’s mother . 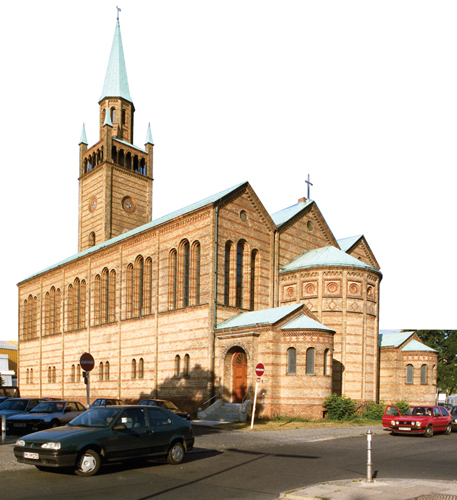 This church is the only historical building to have been preserved in the Kulturforum. Built by F A Stüler in 1844–6, it is also a venue for art installations as well as a hall for classical concerts. 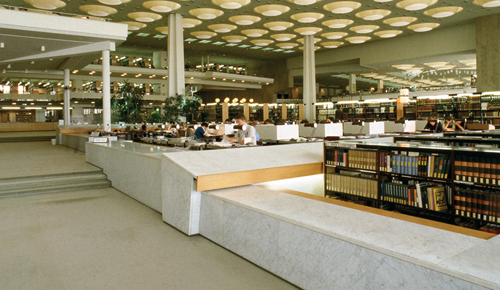 Built in 1967–78 according to plans by Hans Scharoun, the National Library has a collection of five million books, manuscripts and journals, making it one of the largest German-language libraries in the world. The unassuming Art Library holds, among other items, a vast collection of art and advertising posters. It also hosts temporary exhibitions on architecture and art as well as design shows.